Two weeks ago, we asked for your questions and unfortunately, we had to delay posting the answers to the Q&A until today. Please note in some cases we’ve combined multiple questions into one, and we have edited some questions for clarity. We have now opened an official thread for next week’s Q&A, which will stay open until 2pm CDT on April 24th, 2012 (12pm PDT/3pm EDT/8pm BST/9pm CEST/5am AEST). We welcome your questions in that thread and hope you enjoy the answers below. If you want to discuss any of the answers given, please use this Forum thread! 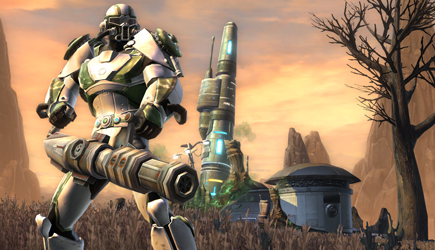 BlackMink: Could you please explain SWTOR's threat mechanics? What exactly do the de-taunt abilities do, and how exactly is threat generated? Is threat directly related point for point to the damage you do, or does each individual ability generate a pre-set amount of threat? Cameron Winston (Combat Designer): Threat is calculated based on damage done, plus or minus certain modifiers, with one damage translating directly into one point of threat. These modifiers are always called out in the abilities which adjust them. For example, Soresu Form increases your threat generation globally, while Crushing Blow or Hilt Strike specifically generates extra bonus threat when activated. De-taunt abilities reduce your threat level by a flat percentage of its current value. Healing generates less threat than damage and is split evenly among all enemies you are currently fighting. Damion Schubert (Principal Lead Systems Designer): This is totally in the plan, but we are unsure at this time when it will get to you. Irouven: What is the idea behind the selection at the equipment vendor for planetary commendations? Sometimes you get boots, sometimes chest-armor, never a potential "full" outfit. Damion: We don't want you to get all of the pieces of an armor set from any one source of gear. We want you to do multiple activities in the game to build out a full set of gear. This is a conscious decision on our part to encourage and reward playing multiple facets of the game. So you should do other things -- heroics, check the GTN, etc -- the full set of gear is out there. Zawny: Any chance there will be an effort to develop account storage somewhat similar in nature to guild banks so that characters on an account can access items rather than mailing them under what the current plan appears to be? Damion: We have a plan for this. However, since there is currently a workaround for this (mailing items to your alt), this is a lower priority than some of the other improvements we have earmarked for the legacy system. DarthBloodloss: Why doesn't ranked War Hero armor (or the new tier of PvE armor) have augment slots? Georg Zoeller (Principal Lead Combat Designer): It is possible to obtain ranked War Hero appearance with augment slots from crafters on the GTN. The schematics for the those items can be found on the PvP vendor and a critical success while crafting them will result, as with other armor, in an additional augment slot. It is also worth noting that we will be adding a way to add an augment slots to existing modifiable armor in a future game update. Aikiyc: Can we get a clarification on how interceptions in Huttball work? Currently, it seems to be mostly random, with a somewhat increased chance of intercepting if all the allied receivers are stunned. Does the number of allies VS enemies factor in? Closest to the center of or edge of the passing zone? Gabe Amatangelo (PvP & Endgame Designer): The player closest to the center of the landing spot circle who is not stunned or mezzed will receive the ball, regardless of what team they are on. Grandmthethird: It seems to me like some companions have a hard time when it comes to gear. I’m sure there is more but I’m thinking specifically of Torian and Skadge. It seems impossible to get aim melee weapons. Is this an oversight? Or am I simply missing something? David White (Systems Designer): Aim melee weapons are used by a very small subset of companions. For this reason we tend to distribute those items through either vendors or class specific quest rewards. Our goal is to make these items reasonably available without constantly putting essentially “worthless” items in front of players who do not care about them. We also make the items customizable (orange) when possible to make it easier to keep them up-to-date by swapping out the Mods and Enhancements. Ultimately it’s a delicate balance to make sure they can be reasonably found and maintained by the players who care about them without them becoming a nuisance to players who might not even understand why they exist.